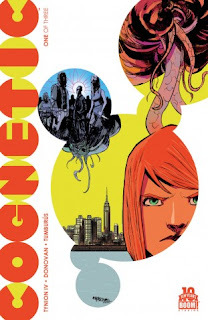 The Fellowship was fortunate enough to obtain a copy of COGNETIC #1 from BOOM! Studios. James Tynion IV writes, Eryk Donovan draws, and Juan Manuel Tumburus colors. Something strange is happening at the Empire State Building. People are jumping, and they’re doing it with unnerving consistency and in groups. The FBI director and the local cops are totally stumped. But Annie, the Director’s aide, thinks she knows what’s going on. She thinks it’s a whole lot bigger than anyone can realize, and she may be the only one who can stop it. That this story is brought to us by those MEMETIC guys should be all you need to know. The premise here is similar – horrible things are starting and no one is quite sure what it is. But there’s something a bit more sinister here; something else might be in control this time. It’s creepy as hell, and I mean that in the best possible way. These creators work together really well to bring us right out of our comfort zone. The worst part of this series is that we know it’s only going to be three parts. I already know I want more than that, and you will too. COGNETIC #1 is available now at your FLCS or at boom-studios.com.